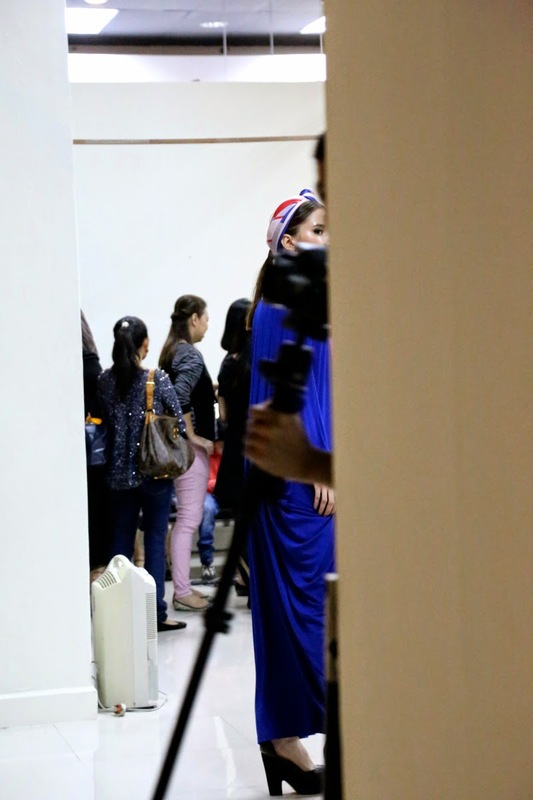 I’ve shared with you in my post One Small Step that aere had our fashion show on the 12th of November 2014. 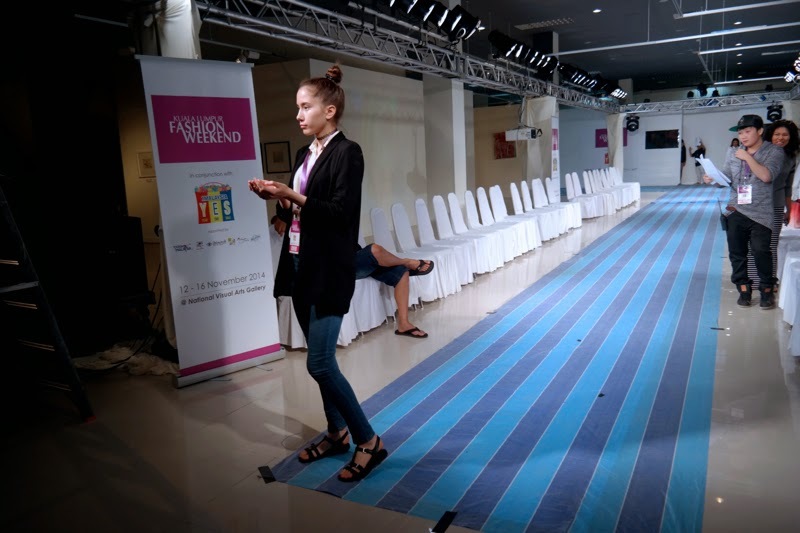 When Fashion Valet invited aere to join the fashion show for their slot at the KL Fashion Weekend 2014 I was so nervous but excited! They informed me less than a week before the show. 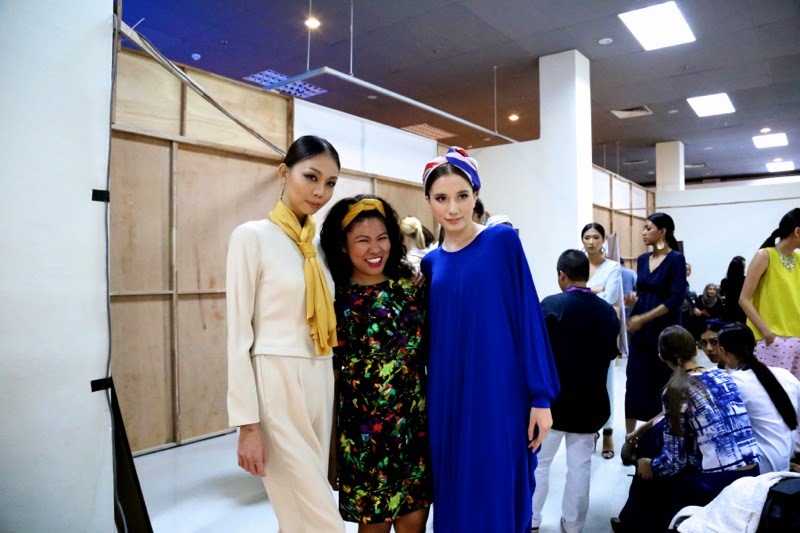 I've been to my share of fashion shows (see some which I blogged about : When Our Eyes Met, Mimpikita : Fashion Lovers Unite, Fashion Showcase of Alia Bastamam & Pu3, Pu3 & Yadotsa The Show and the Beautiful People) but I've never really been involved behind the scenes. So many thoughts were immediately flooding in my head: am I ready? What looks or outfits am I going to showcase? How do I style it? I know that it was a once in a lifetime opportunity and aere was just launched less than 2 weeks at that time so despite my doubts and fears, I grabbed the opportunity and agreed to be in. 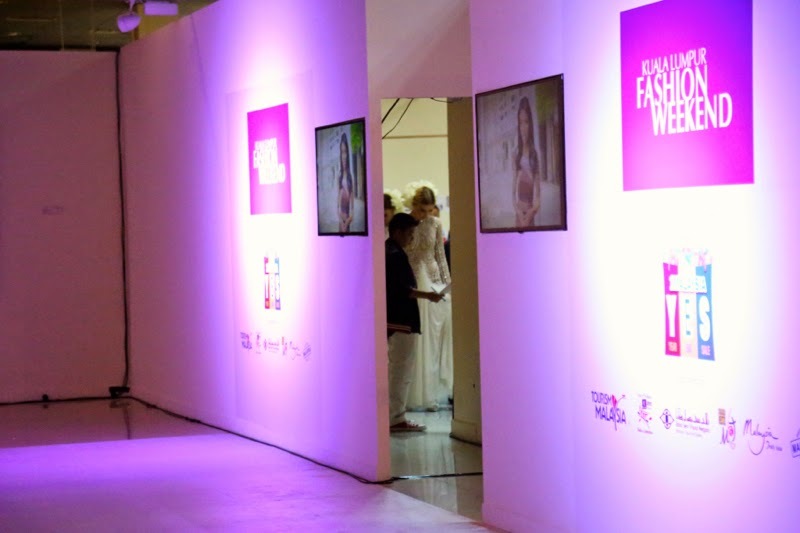 Never would I ever imagine to actually have a fashion show so soon! My first ever! I can’t be more grateful for the opportunity. They also informed me that aere will be collaborating with the remarkable dUCkscarves. Which makes it a double yay for me! Thankfully they assured me that their stylist, Mazni was going to choose the items and style it their own way. But, of course I could get to comment on them. Phew. That was a relief because I'm still learning the ropes and also it was good to see how others would style aere. But the preparation for everything behind the scenes, it was just crazy… Choosing moods, songs, outfits, models, choreography, etc... I really learnt a lot and didn't imagine it to be so much work. 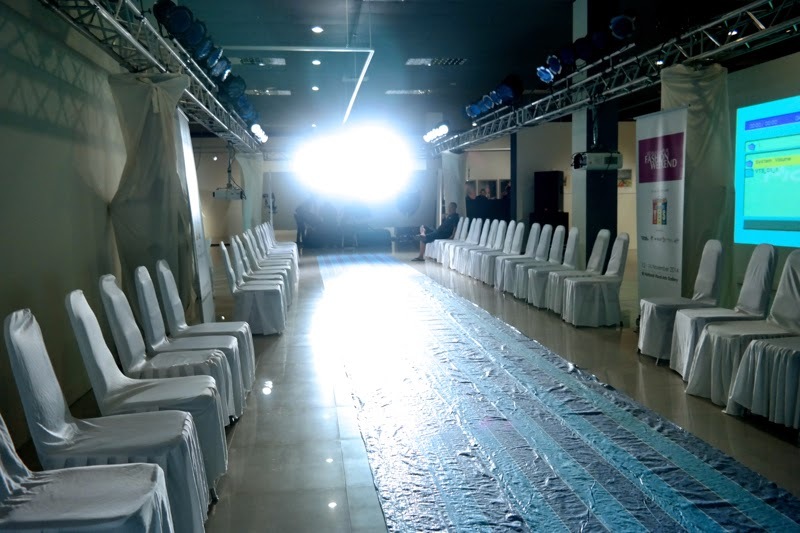 I was there at the fitting of the models the night before the show which was absolute chaos! 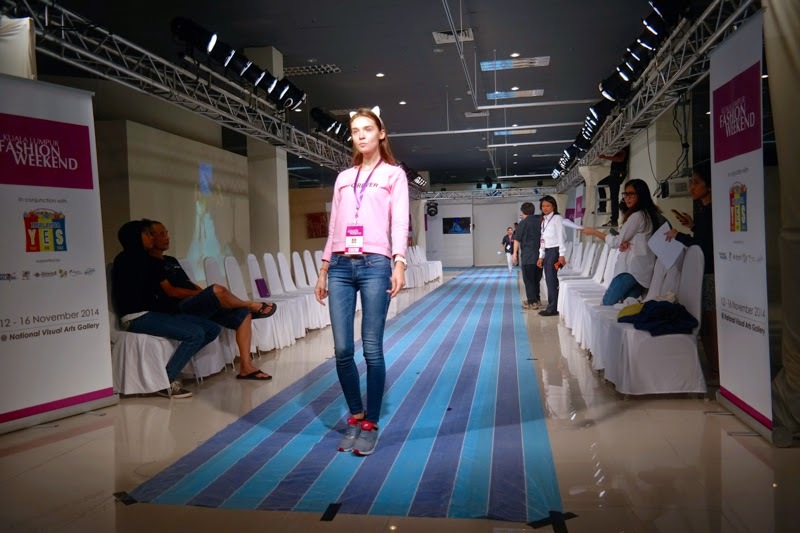 There were 16 models in a room trying out clothes to be showcased the next day. I couldn’t imagine the chaos before but yes I went through it with the FV team. They were awesome! 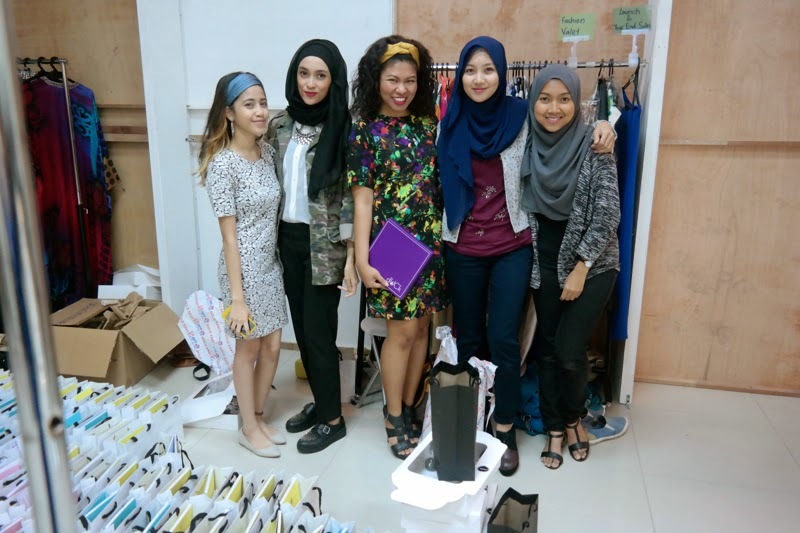 Had “fun” with Nadhira, Mazni and Veen Dee at the fitting. 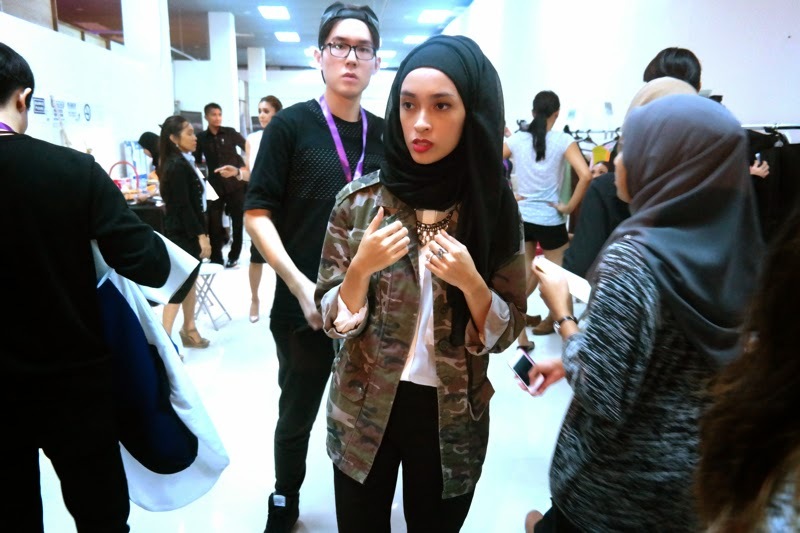 Athirah and Atika of dUCk were there too styling the scarves on the models wearing aere. Everything happened so fast! The models came in pap pap pap, I managed to snap some pictures to see how they look like in the aere outfits and then they were gone! In a split second! Okay, maybe I’m exaggerating there a little bit but really it was just a few minutes. When they were gone, I was just there sitting down quietly and thinking “Wow, it happened just like that and it was just so fast!”. I realize that everything in the fashion industry moves really really fast at light speed. To be honest, I was a bit nervous after the fitting because one of the models was really tall that it made the white ZERENE that she wore looked really short. When she wore aere’s jumpsuit pants together with the ZERENE sequined top, a big part of her belly was showing because the pants were too loose on her! It was a problem for me and we were thinking: what do we do? do we get them to wear an inner or how??? In the end, I decided to pair it with another design from the first collection which was yet to be released. Paired it with another set of pants and tadaa! She looked awesome in it! 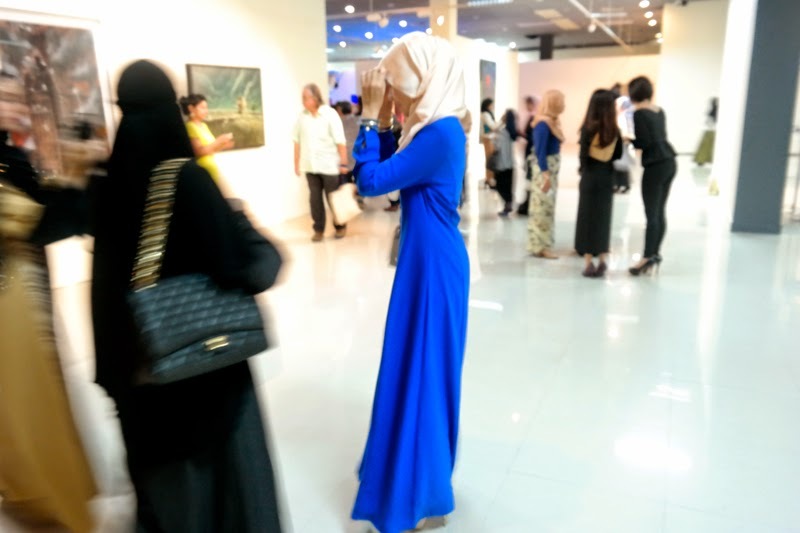 Despite the chaotic preparation, I really loved being part of it. It was just a buzz and I really got to appreciate more of the faceless and nameless people behind the scenes who made everything work. These guys were awesome! The show would not have happened without them. Anyway, here I leave you with photos I managed to capture behind the scenes. I will blog about the show itself and also the people who were there. The pictures of the models all dolled up and with spotlights on them! Hehe. Below are some pictures I managed to capture before the runway was ready! 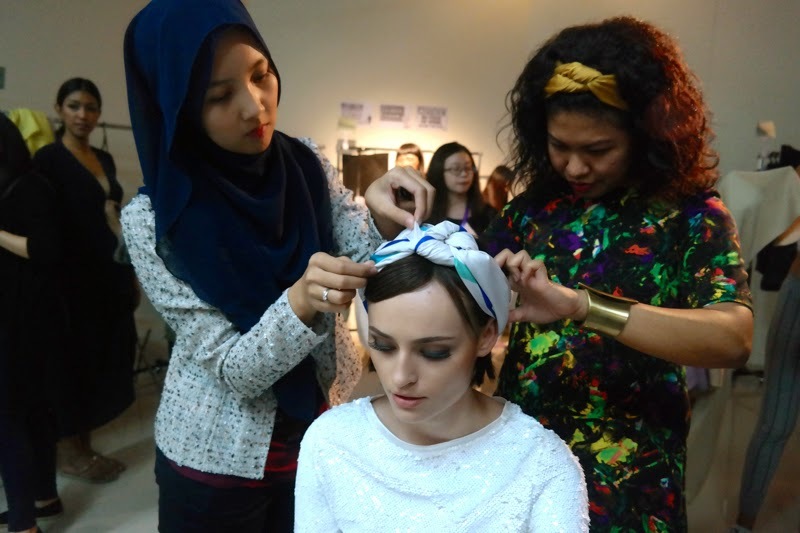 Look at that blue thing, wait for my next post on the fashion show to see what it will be transformed into! Haha. 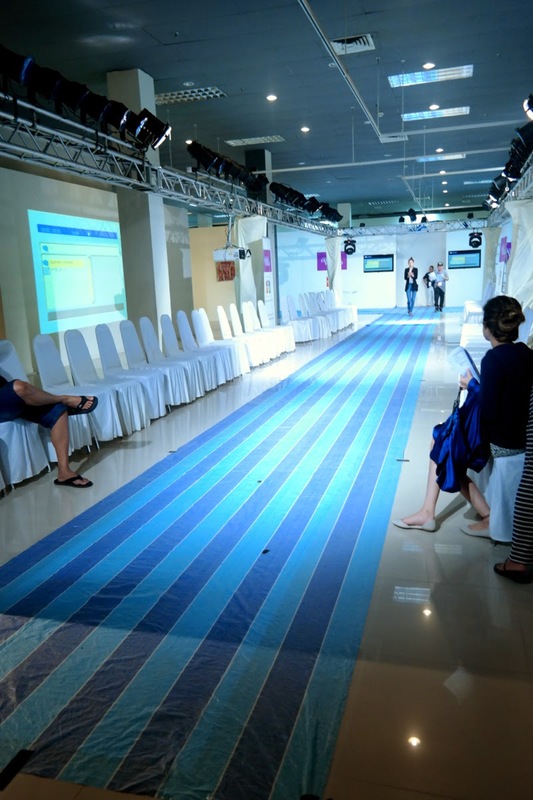 Don't worry, we did not let the models walk on the blue 'carpet'. 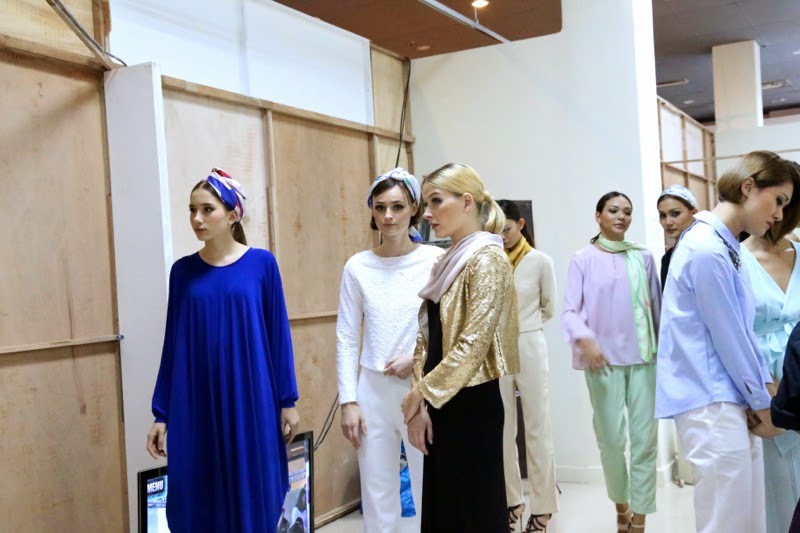 Some candid shots of the models backstage before they walk down the runway. 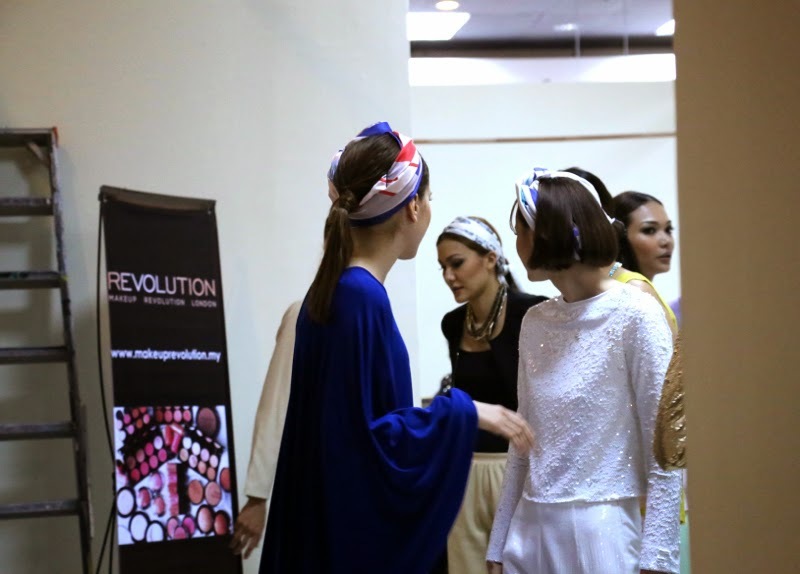 Sorry, but I can't share photos of the models about to get ready wearing aere though. 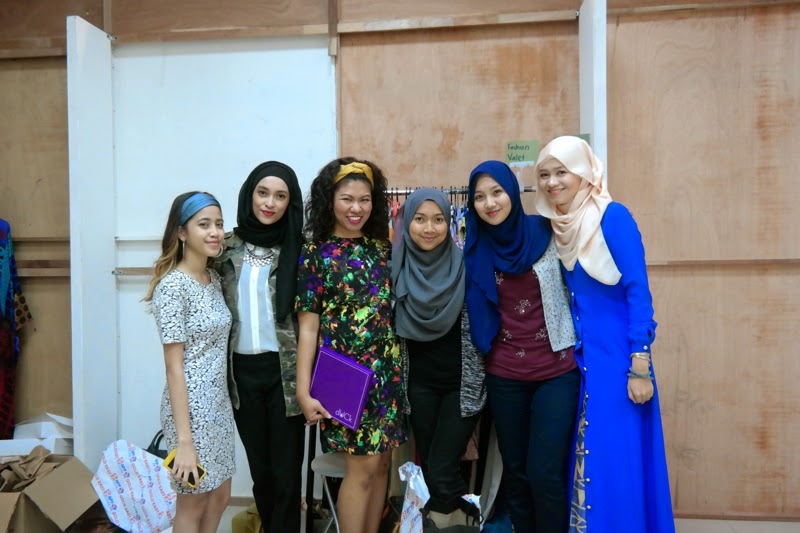 Here's Atika and Athirah of dUCkscarves styling the scarves on the models. 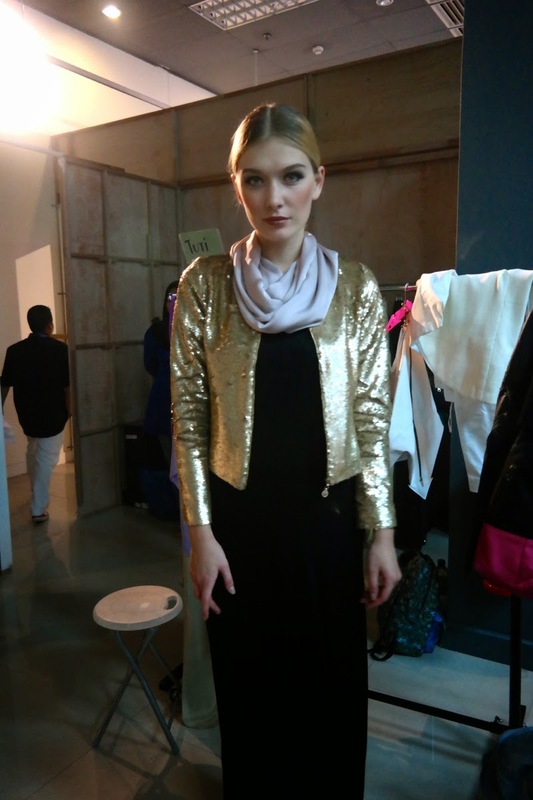 Here are some photos I managed to quickly capture of the beautiful models wearing aere. They are all ready and set for the fashion show! A list of the other labels showcased under the Fashion Valet slot. Labels I respect and admire. Happy to be showcasing aere with them, it's an honour. Mazni, Nik, Atika, Athirah and Nabila who worked really hard backstage! Well done guys! 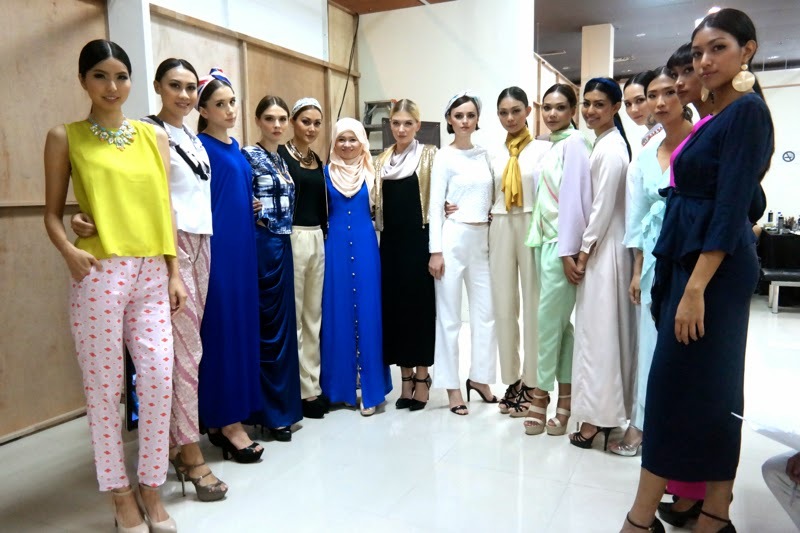 With almost all 15 models wearing aere, Mimpikita and Alia Bastamam. Me getting dizzy and overwhelmed. There were moments that it became a blur! P/s : All photos captioned as "official photos" were given to me by FV (thanks Sam and Farid) the rest were all captured by me or @kneok. I can tell that the minute and miraculous discoveries of your journey will be matched by the beauty of your writing about them. What a treat – thank you.